Two false-colored positron emission tomography (PET) scans of human brains. 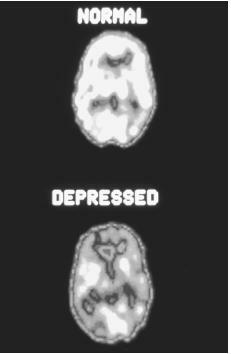 At the top is the brain of a healthy person, and below that is the brain of a depressed person. See color insert for color version. 10–20% lifetime prevalence, compared to 5–10% for men. The average age a first depressive episode occurs is in the mid-20s, although the disorder strikes all age groups indiscriminately, from children to the elderly. There are two main categories of depressive disorders: major depressive disorder and dysthymic disorder . Major depressive disorder is a moderate to severe episode of depression lasting two or more weeks. Individuals experiencing this major depressive episode may have trouble sleeping, lose interest in activities they once took pleasure in, experience a change in weight, have difficulty concentrating, feel worthless and hopeless, or have a preoccupation with death or suicide . In children, the major depression may appear as irritability. While major depressive episodes may be acute (intense but short-lived), dysthymic disorder is an ongoing, chronic depression that lasts two or more years (one or more years in children) and has an average duration of 16 years. The mild to moderate depression of dysthymic disorder may rise and fall in intensity, and those afflicted with the disorder may experience some periods of normal, non-depressed mood of up to two months in length. Its onset is gradual, and dysthymic patients may not be able to pinpoint exactly when they started feeling depressed. Individuals with dysthymic disorder may experience a change in sleeping and eating patterns, low self-esteem, fatigue , trouble concentrating, and feelings of hopelessness. Depression can also occur in bipolar disorder , a mood disorder that causes radical emotional changes and mood swings, from manic highs to depressive lows. The majority of bipolar individuals experience alternating episodes of mania and depression. The causes behind depression are complex and not yet fully understood. While an imbalance of certain neurotransmitters—the chemicals in the brain that transmit messages between nerve cells— are thought to be key to depression, external factors such as upbringing (more so in dysthymia than major depression) may be as important. For example, it is speculated that, if an individual is abused and neglected throughout childhood and adolescence, a pattern of low self-esteem and negative thinking may emerge. From that, a lifelong pattern of depression may follow. Depression is also associated with an imbalance of cortisol, the main hormone secreted by the adrenal glands. Other physiological factors sometimes associated with depression include viral infections, low thyroid hormone levels, and biological rhythms, including women’s menstrual cycles—depression is a prominent symptom of premenstrual syndrome (PMS). Heredity seems to play a role in the development of depressive disorders. Individuals with major depression in their immediate family are up to three times more likely to have the disorder themselves. It would seem that biological and genetic factors may make certain individuals pre-disposed or prone to depressive disorders, but environmental circumstances may often trigger the disorder. External stressors and significant life changes, such as chronic medical problems, death of a loved one, divorce or estrangement, miscarriage, or loss of a job, can also result in a form of depression known as adjustment disorder . Although periods of adjustment disorder usually resolve themselves, occasionally they may evolve into a major depressive disorder. 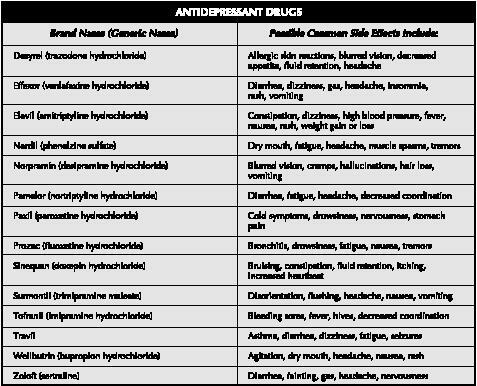 Some of the antidepressant medications that may be prescribed and some of their potential side effects. I don't seem to be getting much better. I take 150 mg of desipramine and 1 mg of clonazepam each day.